When it comes to creating the ideal event space for business gatherings, private parties, and professional conferences, location is everything. That’s why when we saw an property boasting both secluded charm and ease of access in need of a renovation in the heart of Nashua, NH, we jumped at it - and the result has been a success from day one. In just two years, we transformed the Event Center Nashua, located adjacent to our Courtyard by Marriott in Nashua, NH, from an underutilized ballroom space into a bustling hub of activity right in the heart of New Hampshire’s southern Merrimack Valley. After several years of a multimillion dollar renovation, this space is now one of the most inviting of its kind in the region - and it’s all due to a reliable process, great partnerships, and the experience we bring to each and every one of our renovation projects. When we purchased the Courtyard by Marriott in Nashua back in 2014, the space looked much like many other older properties in the area - grand for its original construction date (1989), but not fully updated to the design sensibilities of a modern property. Even more notable: its highly underutilized grand ballroom, featuring over 14,000 square feet of banquet and conference space. When the hotel converted to a Courtyard in 2006, the owner at the time made the decision to stop selling the conference space in the social markets, as well as any market that demanded Food and Beverage operations. While this may have been a significant cost-cutting maneuver, it also left a large revenue opportunity off the table. When we stepped in as owners, we decided to bring that back with a whole new design and new goals for profitability. Working with our renovation partner ROK Builders, our management partner RHG Hospitality, and our Interior Design partner RSJ Associates, we spent two years transforming the hotel and the conference space to match the new Courtyard standards, as well as to reposition the conference center into an “attached” facility with a new signature entrance, brand positioning and marketing and sales plans. 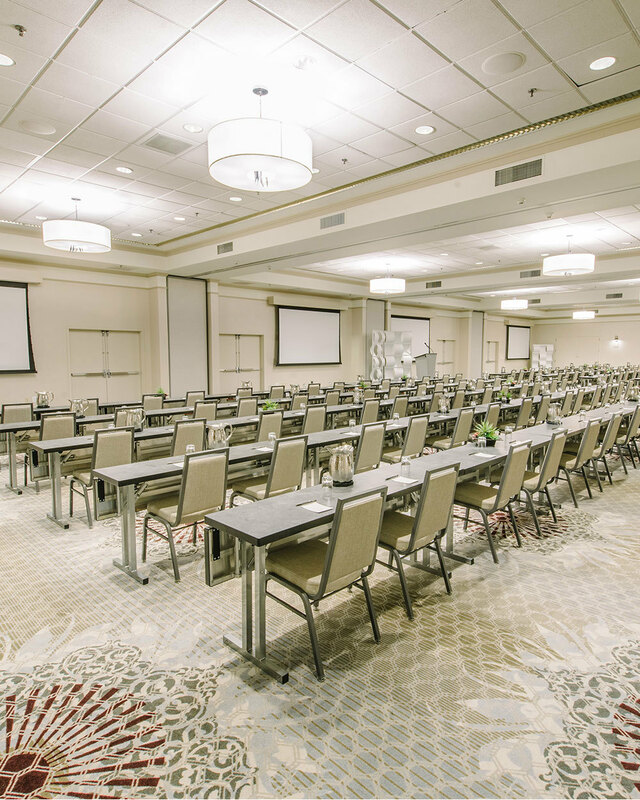 Renovations were completed by September 2015, with the newly-rebranded Event Center Nashua now offering thirteen meeting rooms across over 14,000 square feet of flexible meeting space. With amenities for a new audience now including everything from the full-service hotel attached to a distraction-free environment with the latest travel innovations, this venue now offers an ideal location for a new generation of travelers, visitors, and neighbors looking to gather for a variety of professional and social events. When we first started our renovations of this impressive event space, we knew this would be part of a larger Event Centers project spanning multiple locations across multiple states. That meant creating a consistent brand for all of our Event Centers, with consistent design and messaging that allows each space to reflect its own benefits while staying true to established national brands with which each project is associated. For Event Center Nashua, that meant seamlessly integrating our Event Center branding with established Courtyard by Marriott branding. For the former, we chose to think big - starting with the iconic white tent just above the renovated front entrance, our inspiration for the ECN logo and an eye-catching feature for all guests to enjoy. This comes combined with a nod to Courtyard by Marriott, including consistent colors schemes and design elements stretching throughout the Event Center and the attached Courtyard by Marriott Nashua. While each space makes its own distinct impression, guests wandering from their rooms to the event spaces get a deeper appreciation for the continuity our design teams worked so hard to achieve with each step. Interested In Seeing This Impressive Space For Yourself? Come visit at 2200 Southwood Drive in Nashua, NH, or get in touch with our team and let’s discuss how we bring positive change properties just like this one all throughout the region we call home.